RAUTAHAT, Aug 28: Stating that negligence from Pappu Construction was to be blamed for Saturday’s deadly boat accident, there has been demand from all quarters to punish the contractor. 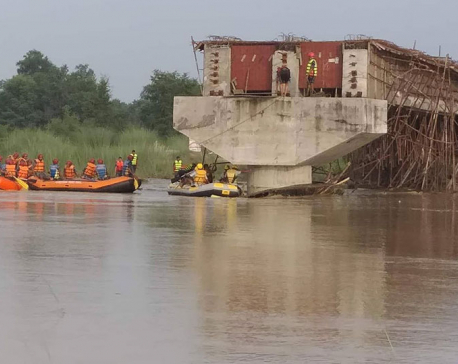 Locals are furious over the incident in Gaur-4 of Rautahat in which flood in Lalbakaiya River forced a passenger boat to hit an under-construction bridge, resulting in the deaths of some locals. They argued that had the contractor finished the bridge construction on time, they would not have been forced to undergo risky journey through boat. Political parties, civil society members, families of the victims, parliamentarians and even the chief minister had expressed outrage that the negligence on part of Pappu Construction led to the incident. Nepal Communist Party held protest in Gaur, demanding action against the contractor. Why can't govt blacklist Pappu Construction?